For the first time in history the Trading Programs are revealed with documentation, how the secret gov / secret space / Deep State is funded! This group is putting their lives on the line to get this info to the public! Follow up interview is scheduled for Thursday February 1st at 7pm PT. Getting the truth out one whistleblower at a time! 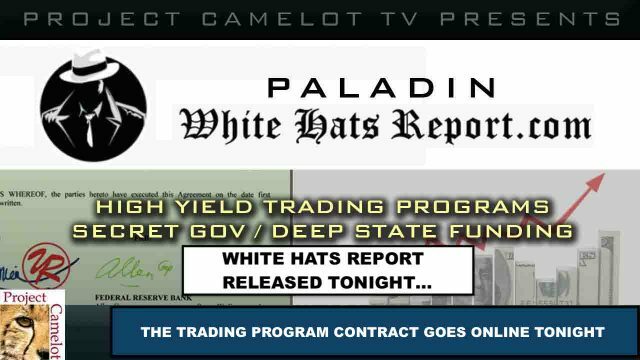 WATCH THE INTERVIEW THAT LEADS UP TO THE RELEASE OF THE EVIDENCE: KERRY talks with PALADIN about the White Hat Reports investigations into high yield trading programs, crypto currency, following the money down the rabbit hole of how the secret space/ secret gov is funded. GO TO : whitehatsreport.com/ FOR MORE INFO. Paladin is pushing the usual stuff. Problematic about him and your interview is the fact that left out of the dialog…..